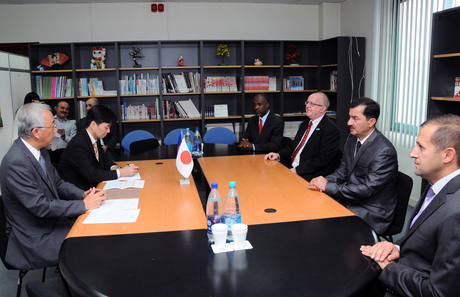 A grant contract for "Improvement of school hygiene of Agdash city" project was signed at the Japanese embassy in Baku. The grant contract was signed by Japanese Ambassador Shusuke Watanabe and chairman of Local Governance Assistance Union NGO Vusal Mirzayev. The project directed to improve the hygiene condition for 1,363 students and 275 teachers throughout construction of sanitary facilities at school compound. The total amount of the Japanese Grant Assistance for this project is about $121,950. This is the first project of the Japanese Embassy in Agdash region and will be performed jointly with UNICEF and municipalities in Azerbaijan. UNICEF Azerbaijan will be supporting this project through the provision of hygiene education manuals and training skills. These manuals present effective methodologies for assisting the behavioural change for safer hygiene. Further UNICEf will be helping Local Governance Assistance NGO to establish collaborative mechanism with its partners such as PTA and local communities. "Grassroots and Human Security Grant Assistance Programme" support projects applied by municipalities, medical institutions, and NGOs, aiming directly at the improvement of living standards of Azerbaijani people. The total amount of Japan`s Official Development Assistance provided for the Azerbaijan is over $1 billion, covering a wide range of areas such as improvement of economic infrastructure, agricultural and social sectors and cultural field as well as human capacity development.